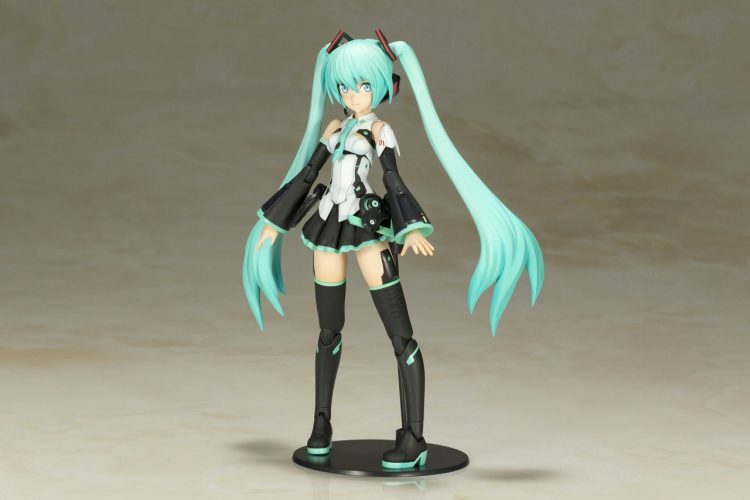 >Introducing Frame Music Girl Hatsune Miku! 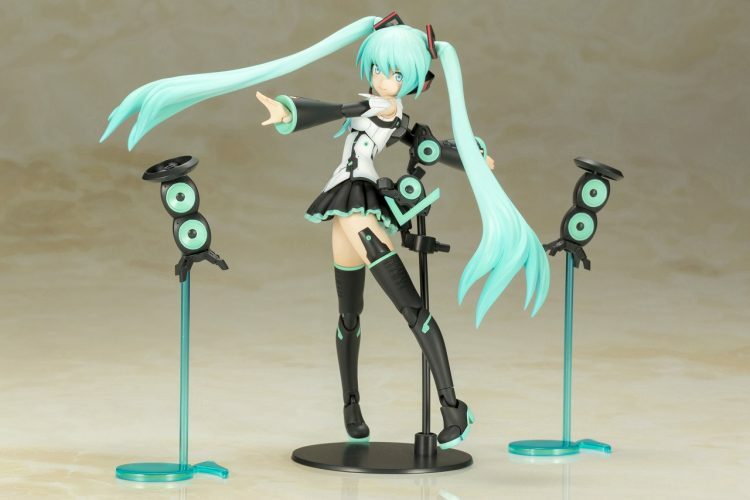 Introducing Frame Music Girl Hatsune Miku! 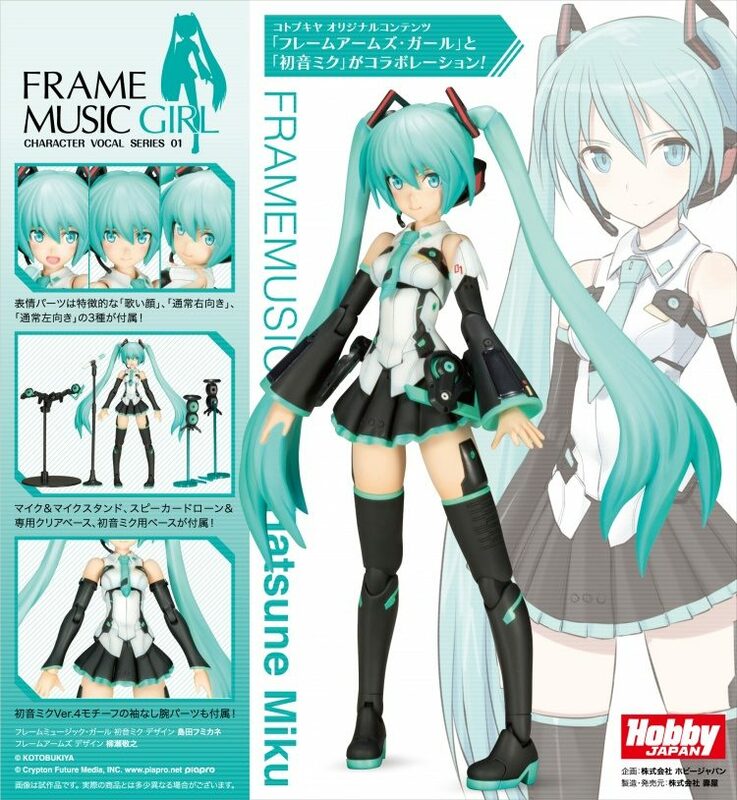 Frame Music Girl Hatsune Miku! 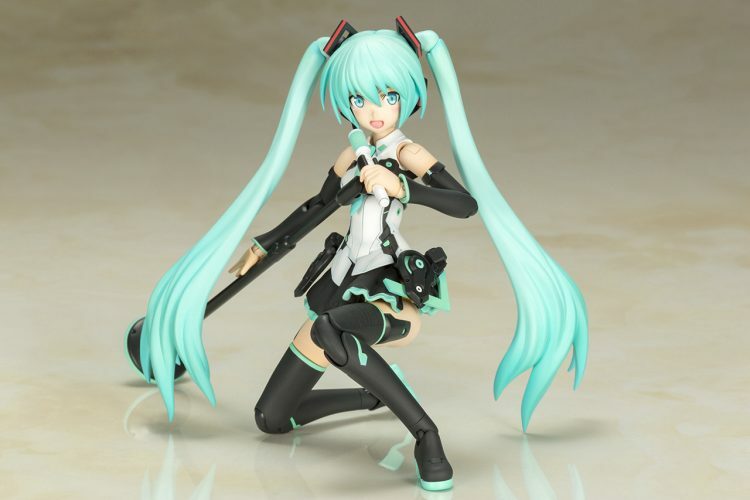 This plastic model kit of the popular vocaloid is a collaboration between Kotobukiya’s original series, Frame Arms Girl and Crypton Future Media’s Hatsune Miku! 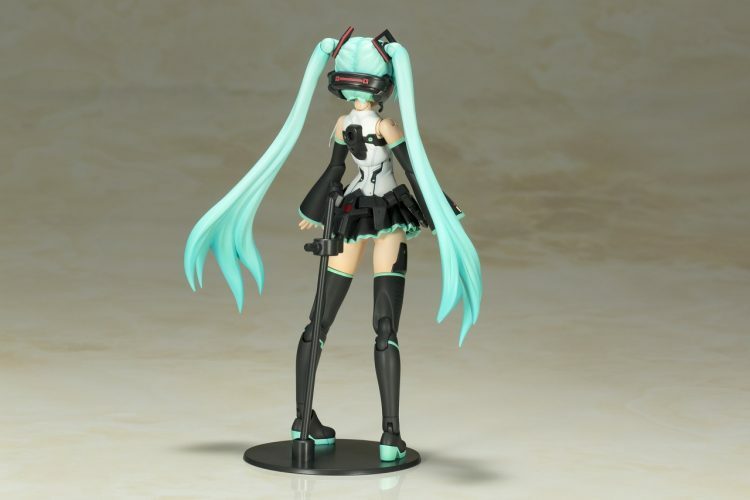 Thanks to the support of Crypton Future Media and Hobby Japan, we were able to bring Miku to life in the familiar style of our Frame Arms Girl creators, Fumikane Shimada and Takayuki Yanase. This was Fumikane Shimada’s original concept art. We made sure to keep the Hatsune Miku’s features recognizable while also giving her the signature characteristics of a Frame Arms Girl. The same goes for her accessory drone parts. Now let’s start with a front-to-back overview of the product! 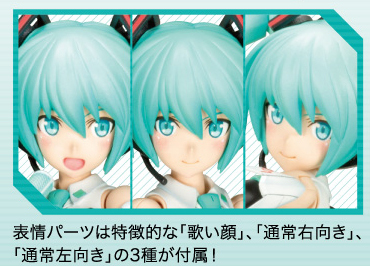 Miku comes with three unique face parts: Singing, looking left, and looking right. 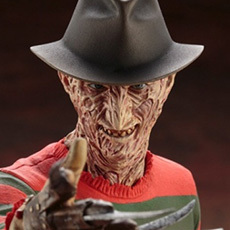 All of the face parts are pre-printed, and all of the pieces for the model are made of colored plastic for easy assembly. 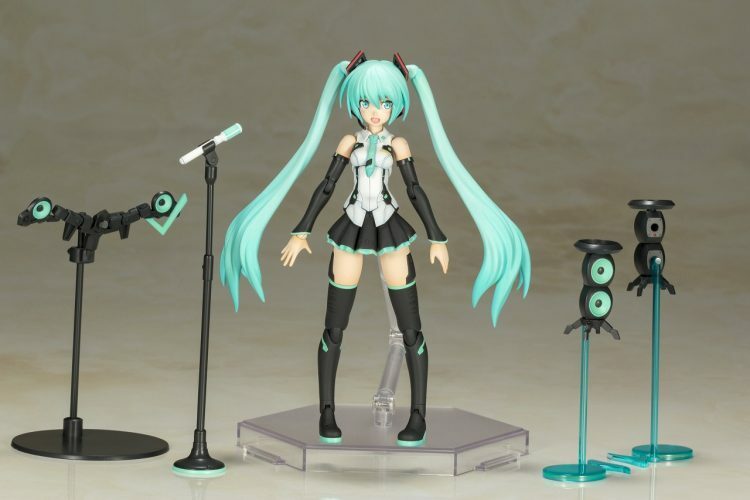 The kit also includes a mic, mic stand, speaker drones with clear turquoise bases, and a special base black for Miku. (The clear base in the picture above is MB-48 New Flying Base and is not included with the set). The speaker drones can be connected to each other and displayed alone or attached to their turquoise musical note shaped bases. 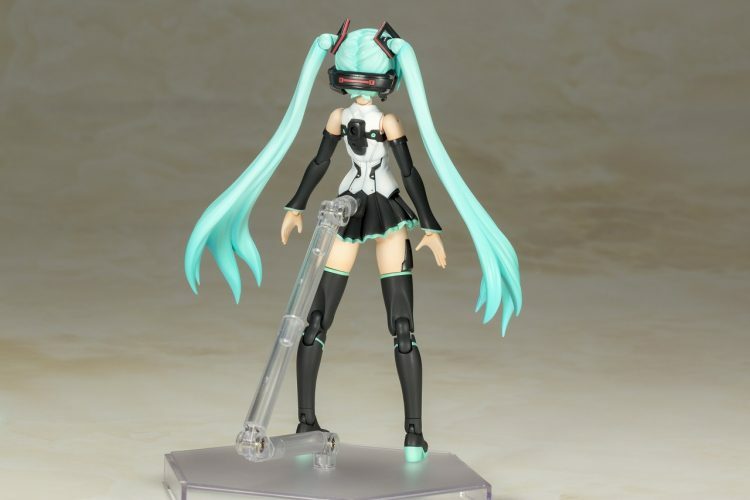 Miku’s waist has several points of articulation, and you can also attach the drones to her back. 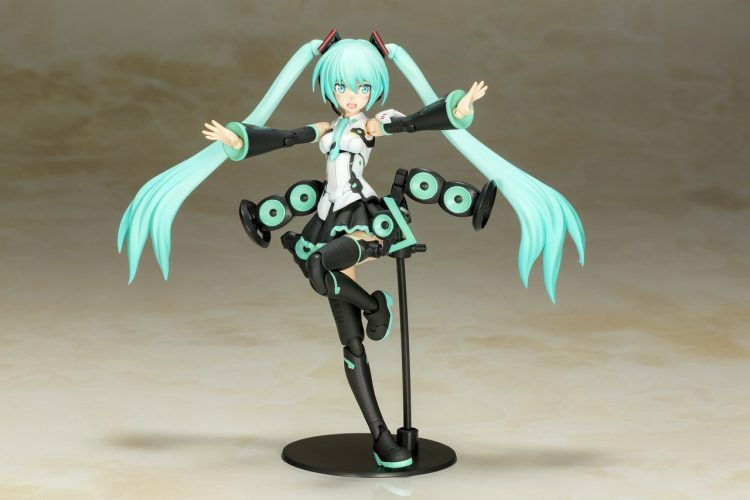 As part of the collaboration, we included arm parts based on Hatsune Miku Ver. 4 without the wide bell sleeves, giving her a different silhouette. The skirt is moveable, giving the legs a wider range of flexibility. Additionally, the model has pop-out shoulder joints. a poseable waist, and the full articulation that is the standard for the latest Frame Arms Girls, making it even easier to display her in lots of different poses. And of course, her back and waist are equipped with Kotobukiya’s standardized 3mm connection points, making her compatible with parts from the Frame Arms, Frame Arms Girl, and M.S.G Series. 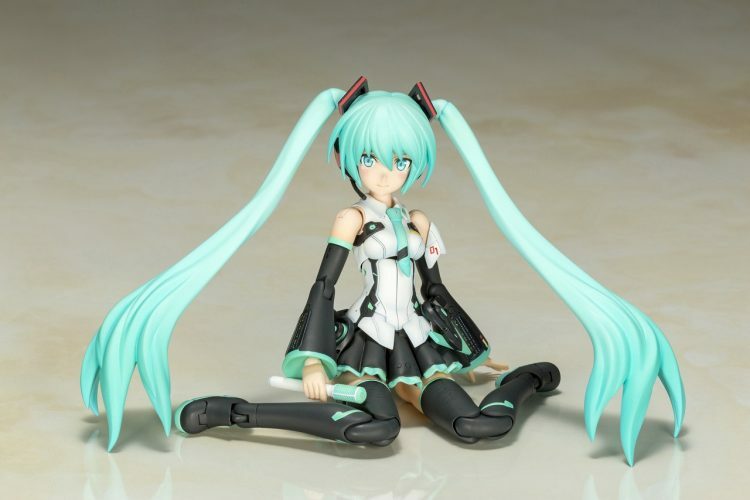 Hatsune Miku, brought to you by Kotobukiya’s superior craftmanship! You can see the Japanese product page here! Only ASRA Archer and Ninja are available at this time, but you can look forward to more coming soon! 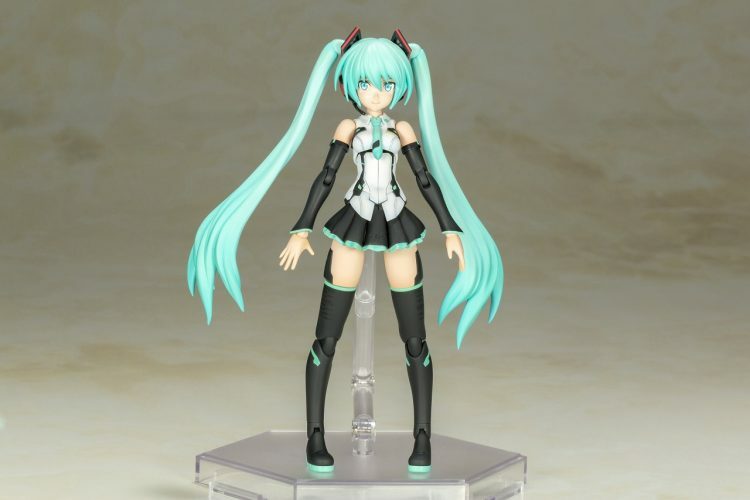 Starting from Hatsune Miku, the link will also be printed in the instructions that come with the kit! 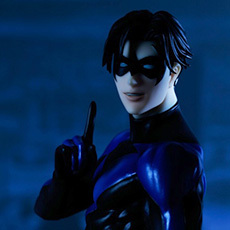 前の記事 2018.04.02 IKEMEN Nightwing Sample Review 次の記事 2018.04.19 Freddy Krueger Makes His Way to the ARTFX Horror Series! The Domino BISHOUJO is here! DC Comics BISHOUJO: Catwoman Returns! MY LITTLE PONY BISHOUJO Twilight Sparkle is Here! The Red Protector of the Crystal Reactors: AGNIRAGE is here!